Many years ago I opted to go with mechanical refrigeration instead of Ice, to keep items cold. For a long time I just used the main starting battery to power the fridge. I never had any problem with this set-up, but never liked doing it. 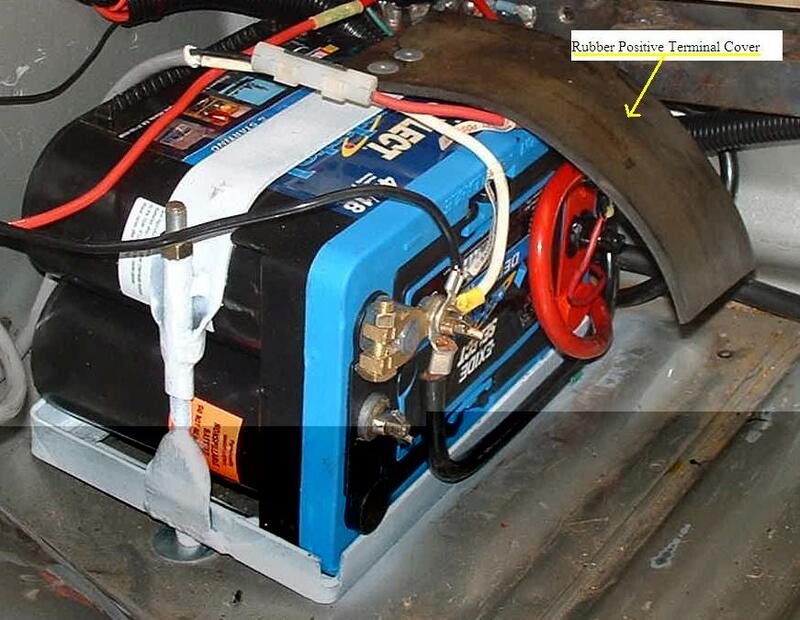 In 2001 when I got my Toyota Tacoma I had the plan to add and Aux battery. Within two months I had installed a Sure Power Battery Isolator (mod# 9523A-D) and a 2nd battery. It’s been working flawless ever since. Installing the Sure Power unit is outlined well with Sure Power’s instructions. Here are a few pictures of my auxiliary battery. I have it mounted in the left forward corner of my bed. It fits between the left wheel well and the front of the bed. I fabricated the holder about a year and a half ago when I changed my sleeping platform. This was done to lower the height of the battery. One of the main reasons behind the fold down bed was to gain head room while crawling into and out of bed. Having the top of the battery above the bed level wasn’t good for me. So laying the battery on its side solved this issue. The forward foot and a half of my truck bed is storage for items I don’t access often, but have found useful to have in the backcountry. On the Positive Terminals (marine batteries have two) I coated all the metal with liquid electrical tape. I also took some thick rubber mat to make a terminal cover for added protection against a short circuit. After 5 years I replaced the deep cycle Auxiliary battery. During the battery R & R I snapped these pictures. 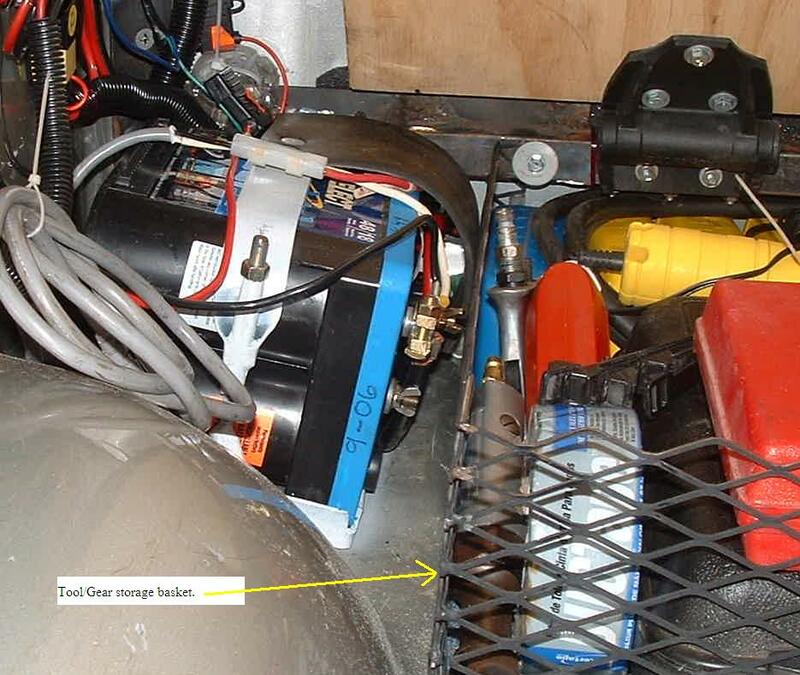 Some may wonder; since the battery is on its side, "Why not install it under the hood on the Passenger inner fender like many other Tacoma owners have done with very good success?" In my opinion, Deep Cycling and Heat kill batteries faster than anything. I can somewhat control deep cycles on my battery, but heat is harder to control. Even inside my cab, temperatures can run very high on some of the mid-summer desert trips I make. Also I try not to add weight over my front axle, when I can.